This is the standard “Letter” setting in the “Print” profile, with RGB for our color, as this will be used on screen as opposed to print. Next, lets draw out a rectangle the size of the whole page, after all, the best way to get a document shape is to start with the size of an actual document. You can use the Command right above the divide tool (the 2 squares on the top left of the pallet) to take the corner, and “Merge” it together, be sure to hold down the Alt key on your keyboard so that it will also remove unnecessary and touching lines. We’ll treat that the same as the paper, with a nice thick offset to make our button contrast, which is important especially when you get down to smaller icon sizes. 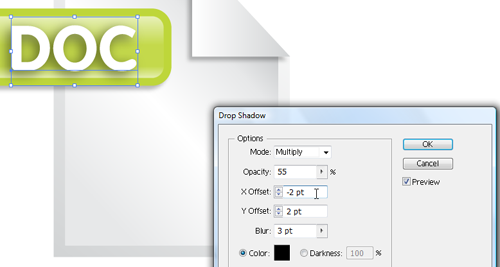 Now we color the icon, create a gradient that looks something like what you see here. We’ve got our paper almost done, now just use the “eyedropper” tool on the outside of the paper (the simpler gradient, and we should be good to go. You’ll also notice at this point, I’ve removed the strokes from all the objects in the file, they really just serve as a hard edge and it’s not really the look I’m going for on this one, feel free to keep them if you like. Now use the extra white space to fill it with the logo for your file-type or program, in this case, how could I resist using my own logo? Ahh judge me all you want, but after you make your own icon I want a letter thanking me! You're done! Great job! now you've earned the right to download the free vector document icon now and compare our results.